Simply because it allows genocide. I thought God gave instruction and Man committed Genocide? Not the flood...or anyone who allows natural disasters. But wasn't the flood primary aimed at freeing slaves? It wasn't just to murder people for fun was it? I cant argue with the fact that God does commit genocide, but who would disagree with the motive? Would you allow a group of people to remain enslaved until the end of time? I thought the purpose of the flood was to drown the sinful and start over again. I'm not aware of any other Gods or Goddesses committing genocide but it's plausible considering the number of stories about their anger getting the best of them from time to time. 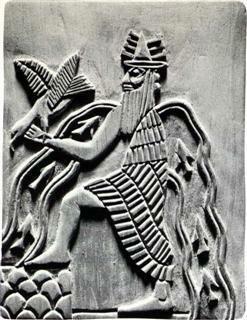 The Greek and Sumerian pantheons are full of wrathful stories, like Zeus and Inanna for instance. You were thinking about Passover. I don't know how much respect I can have for the omnipotent beings in this universe. At least the deities of old were as flawed as their creations. These relatively new deities are perfect while we are flawed and reminded of it constantly. I can certainly understand why people felt a closer connection to deity in the old days. No doubt why the current Pagan movement has had such an impact. I'm starting to think the deity I believe in is quite flawed.